Final Fantasy XIII has been a resounding success across the globe. In Japan, a special white “Lighting” limited edition PS3 was released to coincide with the launch of the game. Now the game is about to “re-launch” in Asian territories and a new bundle is being offered to add extra hype. However, it’s not a console bundle, it’s something else and it’s quite “shocking”. 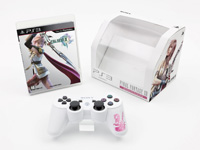 As Japan and Sony prepare for a re-launch of the ever-so-popular Final Fantasy XIII in Asia, they have announced a limited edition DualShock 3 bundle. The bundle will list for $90 and with that the game is included as well as a special PSN card and a lightning-themed controller. It is worth noting that the design to the controller matches the one seen on the Lighting PS3 Slim that came out in December for Japan.